The young men and women in traditional costumes of red, blue and white, the colors of the Assyrian flag, jumped into the middle of the park. With feathers or gold tiaras on their heads, they danced, kicking up their feet to a traditional song as the New Year’s party reached its peak. “We Assyrians must remain united,” one song rang out. Older men watching raised a glass of Arak, an anise-flavored alcohol drink, to the dancers. The dance circle grew, as women, men and militiamen guarding the daytime party joined. It is the Assyrian New Year, or Akitu. And the start of year 6768, by their calendar, coincided this time with Easter, a rare occasion that gave the small and ever shrinking community of Assyrian Christians in northern Syria more reason for their celebration Sunday. They were snatching joy out of a site of tragedy. The village of Tal Arboush, where the organizers held the celebration, is one of more than 30 villages along the Khabur River that were destroyed when Islamic State group militants descended from the nearby mountain in February 2015 and rampaged through, kidnapping 226 residents and sending the rest fleeing. The villages remain deserted and in ruins. Years of war and instability had already been eroding the community in Syria, and the IS onslaught was the final blow that nearly finished it. From nearly 20,000 Assyrians in Syria before the war in 2011, there are around 1,000, according to local activists. Assyrians are a community that traces its heritage back to ancient Mesopotamia. They speak a Semitic language distinct from Arabic. There is also a beleaguered Assyrian community in Iraq, and a smaller population in Turkey. About 200 members of Syria’s remaining community came to Tal Arboush to show their resilience. “We wait for this occasion to have a little fun,” said Ornina Shlimon Ayo, a 23-year old, who had just come out of the dance circle. They came from the nearby towns of Qamishli and Tal Tamr where they now live, bringing food and drink to the village, where many of the houses are in rubble. A tailor prepared Assyrian flags and pictures of Lamassu, an ancient Assyrian protective deity with the head of a human and body of a winged bull, to pass around. Small barbecues were set up in the corner of the park, and a DJ kept Assyrian songs running, many of them by well-known Assyrians in exile. At one point, an older man and his friend on a buzuq — a stringed instrument — played a few songs. A history teacher struggled to keep the attention of the audience as he lectured them, in Arabic and not in Assyrian, about the ancient civilization and one of the community’s modern-day heroes, born in the 19th century around the New Year, Gen. Agha Petros, an Assyrian military leader who battled the Turks in World War I. Before the mass exodus, Akitu, which is also the ancient Mesopotamian spring festival, was the time for collective weddings, held on the slopes of the nearby mountain. Those weddings have now almost disappeared because of the dwindling community. Also, Assyrians fear the mountain could be mined or shelter IS sleeper cells. Only a few marriages take place these days, mostly held in churches. 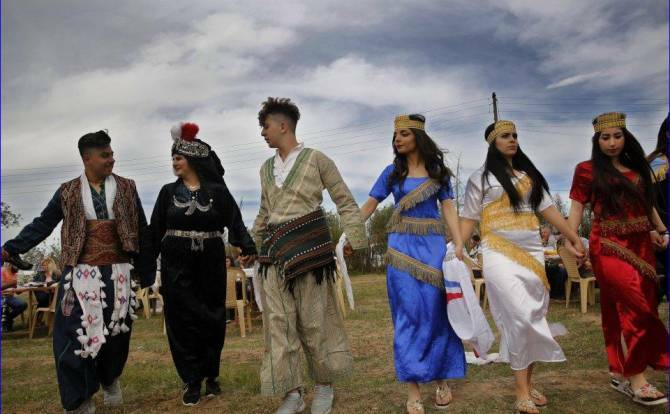 Wael Warda Marza, a local Assyrian politician, said he hoped the New Year celebrations would serve to attract the thousands of Assyrians who migrated abroad. Still, they are wary. Assyrian security men toting automatic rifles guarded the party from the rooftop of a building overlooking the public park. Others milled around near the parking lot, some filtering in the joint the dance. The trail of destruction left by the Islamic State group serves as a reminder of how vulnerable the community is. With IS largely defeated across Syria, the main Kurdish militia, backed by the U.S., has set up a new administration in northern Syria. It has made a largely symbolic effort to be inclusive of minorities, giving Assyrians and other communities seats in local councils. It has also given support to Assyrian militias. These Assyrian militias now still guard the deserted villages, fearing they will be overtaken by the nearby Arabs or Kurds, who greatly outnumber them. There are still fears of IS re-emergence. The IS militants stormed a dozen villages one night in February 23, 2015. In coordinated attacks, the militants kidnapped 226 residents. The Syrian government had withdrawn from the villages and the Khabur River valley area in 2012 as it tried to control territory elsewhere amid the chaos as protests against the government turned into armed conflict. Local militias took over security in the villages, but residents filtered out steadily, fleeing the instability. So that horrific night three years ago, the militia couldn’t protect the residents or the area’s ancient churches from the well-armed, aggressive IS militants. Zaya Youkhana, a 52-year-old resident of Tal Jazira, was not in his village when IS stormed it. It was the largest village in the area, and IS kidnapped all its 82 residents, including his uncles and aunts, among the 226 Assyrians total carried off by the group that night. It took a year, but a local bishop was able to gather donations abroad to pay ransoms that eventually won the freedom of all the captives — almost. Three residents were killed in a grisly video released by the militants during the negotiations. And Youkhana said the granddaughter of his uncle was never found. “We don’t know her fate. We hope she returns to her family safely,” he said as he stepped over ruins to reach his uncle’s mulberry tree.